Since a modest part of my retirement income derives from common shares of the Bank of Nova Scotia, I thought it might be instructive to delve into the early history of banking in the Maritime provinces. It all seems to have begun in 1820 with the founding in Saint John of the Bank of New Brunswick, a publicly held joint-stock corporation. 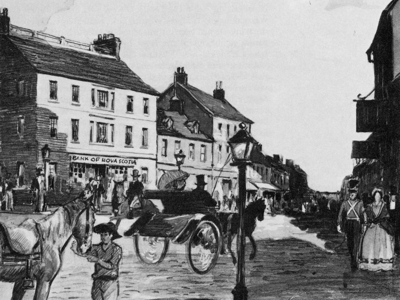 In Nova Scotia the privately-held Halifax Banking Company opened for business in 1825; but not only had it de facto a financial monopoly in the province, the actions of its partners while they were members of the Governor’s “Council of Twelve” had, as Joseph Howe observed, left Nova Scotia “with one currency for the rich and another for the poor" [1, p. 122]. In the end a group of Halifax businessmen proposed to form a publicly held bank; and on 30 March 1832 royal assent was given to a provincial bill incorporating "The President, Directors and Company of the Bank of Nova Scotia." With the Bank's incorporation accomplished, there ensued the procurement of supplies, equipment, and staff. The shareholders elected the required thirteen Directors. The Directors elected William Lawson as the Bank's first President (a position he held until 1837), and they appointed James Forman as the Bank's first Cashier at an annual salary of $1,200. The Bank’s remaining staff comprised two tellers, each paid $500 annually, and a messenger for $200 annually. Banking chambers were leased in John Roman’s stone building at the corner of Granville and Duke Streets [2, p. 23, also shown above]. “In the hierarchy of the Bank, slightly below the Directors and much above the clerks, was the Cashier, James Forman, who had now been the chief operating officer for thirty-eight years. The Directors had grown accustomed to relying on him to carry out their decisions: they respected his social position and his skill with columns of figures. He prepared the necessary reports and statements and kept the books. Even if by 1870 the Cashier's annual salary had increased to $2,100, the embezzled amount could have paid it for 150 years; furthermore “it was nearly half the shareholders' total equity in 1870, and more than 15 per cent of the Bank's total assets.” [2, p. 47] Immediately after the discovery of the theft Foreman, in partial restitution, transferred to the Bank property worth almost $180,000. He then fled to London where he died early in 1871. The Honourable Sir William Young, Chief Justice, when reviewing the facts of the case heard by the Supreme Court of Nova Scotia, could hardly suppress his incredulity at what had transpired. One of the co-defendants in the court case was the Honourable Alexander Keith, of Keith’s IPA fame, who served as a Director of the Bank of Nova Scotia from 1837 to 1872, and who was also one of five sureties of a $40,000 bond to guarantee James Forman’s fidelity and good conduct as Cashier. In the end the Bank of Nova Scotia weathered the financial crisis. The exposure of the defalcation coincided with the end of a 33-year development stage in which the Bank experienced a modest average asset growth of 3 per cent per annum; for the next 50 years the Bank enjoyed a healthy average asset growth of 8 per cent per annum. And today, after 179 years of operation, it ranks as Canada's third largest bank in order of both assets and market capitalization. Joseph Andrew Chisholm, ed., The Speeches and Public Letters of Joseph Howe. (Based Upon Mr. Annand’s Edition of 1858). Volume 1. Chronicle Publishing Company, Halifax, 1909. Joseph Schull and J. Douglas Gibson, The Scotiabank Story: A History of the Bank of Nova Scotia 1832–1982. Macmillan of Canada, Toronto, Canada. xvi+421 pp. I based this essay largely on the engaging presentation of the Bank’s early history in chapters 1–3. “The Bank of Nova Scotia v. James Forman et al.,” 4 February 1873, pp. 141–161 in John M. Geldert, Jr., and James M. Oxley, eds., Decisions of the Supreme Court of Nova Scotia, Volume III July Term 1872, December Term 1874–75. A. & W. Mackinlay, Halifax, 1883. viii+590 pp. Available online.